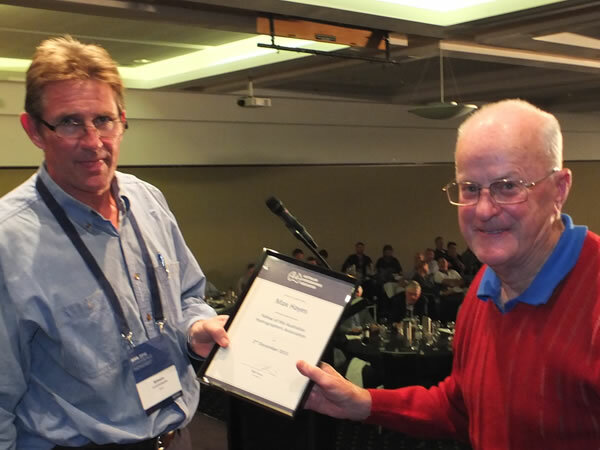 Max Hayes was inducted as a Fellow of the Australian Hydrographers Association on Tuesday 26 October 2016. Max worked for Latrobe Valley Water and Sewerage Board in the construction area. until 2000, when the Board was terminated. Max then started his own company, Gippsland Hydrographics, engaging in contract hydrographic and water sampling work for various authorities. In 2008, he semi retired, but still does some water quality sampling. Max served for many years as Victorian representative on the AHA Committee and has served as Treasurer for approximately 30 years, a record of commitment that will probably never be matched! Congratulations Max for your significant contribution to the profession and your appointment as “Fellow of the Australian Hydrographers Association”.